When saliva, food, and fluids combine in your mouth, they produce the nutrition that allows plaque bacteria to grow and produce harmful toxins. This can be especially damaging at the gum line where the teeth and gums meet. Over time, excessive build up can lead to bad breath, inflammation, weakened tooth enamel, and ultimately, gum disease. The scientists at Crest know that when it comes to your daily oral care routine, taking care of your gums is of the utmost importance. That’s why through years of groundbreaking research they developed Crest Gum Detoxify, a toothpaste designed to target the bacteria around your gum line to keep your gums healthy. Crest Gum Detoxify is a brand-new line of toothpastes that is clinically proven to neutralise the harmful bacteria around your gum line. When you brush, it produces a cooling foam that cleans deeply, penetrating hard-to-reach areas your toothbrush can’t always get. Gum Detoxify uses an active ingredient known as stannous fluoride (or SNF2) which binds to the toxic bacteria, not only killing it, but neutralising its effect on your gums. In combination with flossing, twice daily usage of one of the Gum Detoxify varieties can reduce gum bleeding and inflammation in eight weeks, giving you clinically proven healthier gums. Proper oral care is the best way to deal with the harmful bacteria in your mouth. While regular brushing and flossing go a long way, you may want to consider a toothpaste that is specially designed to manage harmful plaque bacteria around your gum line. 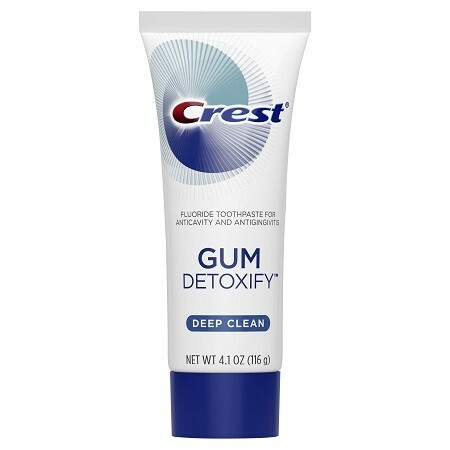 Because of how it’s formulated, the Crest Gum Detoxify line of toothpastes can effectively clean and protect your mouth.